Business circle: Minister Inniss (second left) with (from left) Michael Turton, and Tracey Shuffler and Lalu Vaswani of the BCCI. Government’s new business minister has presented his to-do list to the local private sector, singling out job creation, earning and saving of foreign exchange, and a focus on innovation as among his top priorities. 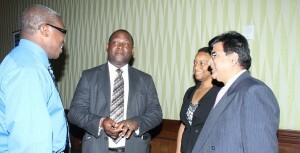 But Minister of Industry, International Business, Commerce and Small Business Development Donville Inniss, who invited members of the Barbados Chamber of Industry and Commerce to have candid and frequent talks with him, warned that these and other required improvements could falter if workers didn’t produce more and the island did not become more business friendly. The official made the comments this morning while speaking at a “Meet the Minister” function organised by the chamber at Hilton Barbados. “Generally speaking there are basically three tasks that lie ahead in this ministry in working with you in the private sector, and that is to work on expansion of job opportunities in Barbados, to bring to the fore greater opportunities for earning foreign exchange and also saving foreign exchange and of course the issue of innovation, which is one that we don’t talk a lot about, but certainly is very critical for us as we move this economy forward,” Inniss said. He told business leaders that he was seeking “a partnership and a team approach to addressing the challenges confronting businesses in Barbados”, pointing out that “certainly in this reconfigured ministry I have been given the task of serving as Government’s … liaison between the state and private sector”. One of the minister’s biggest concerns was the impact of productivity on business success and what it meant for the overall economy. “Human resource concerns must also be put on the table. At the end of the day we are a service oriented economy and we need to ensure that productivity is maximum wherever, both the state and private sector and this is an issue that we have to address,” he stated. “I am very concerned as a minister about the level of productivity in this economy and society and it cuts both ways. It’s a matter of how we manage our businesses and state departments, it’s also a matter of employees recognising that if they don’t produce at the end of the day they are not going to be guaranteed an income. Inniss told the private sector representatives that he was also “mindful of the economic challenges that continue to confront this society and you are certainly the ones who are in the forefront”. “It has not been an easy five years for any of us, either on my side – the state side – or your side – the private sector – but we have to move towards the future, and I am mindful generally speaking that some of the challenges that confront the business community in Barbados relate to the issue of business facilitation, which has to be addressed in a very frontal manner, no sense burying our heads in the sand on this matter,” he stated. Need for more productivity! Yes Mr. Minister, this is especially true in the public service, starting with receptionists who work in the various government departments. One has to wait between fifteen to twenty minutes before someone answers the telephone. Next – the agencies that offer aid to the public. SOME of the officers treat people with disrespect as though they are begging and are pests and humbugs. WE NEED A COMPREHENSIVE SHAKE-UP IN THE PUBLIC SECTOR. With Tourism being the main economic engine that drives Barbados, superior public service should be stressed instead of more productivity. I recently had the privilege of visiting Barbados for the first time recently and was surprise by the lack of respect and hospitable behavior shown by the owner of a hotel (Sweetfield Manor in St. Michael). http://www.sweetfieldmanor.com. When you spend US $300/night you expect superior hospitality…Is there anyone regulating these establishment????!!! I believe that the Barbados Tourism board and other public facing organizations should be proactive instead of allowing these cancers to fester….with potential of causing the demise of the Barbadian tourism industry and subsequently the Barbadian economy. Barbados is such a beautiful country, public servants needs to receive the proper training and be aware of their role in upholding the integrity of the country.